We’re totally serious about this. You didn’t think that you could go on an exotic and life-changing vacation without there being some real danger? 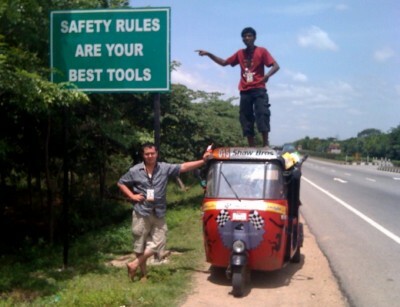 India is a country like no other and you’re driving a vehicle not well regarded in safety crash tests. The good news is that because auto rickshaws have low maximum speeds they’re not likely to get into major crashes. We train you on how to drive safely and what to look out for on the specific roads you’ll be on. However your personal danger quotient is directly relational to the choices you make. In the history of the Rickshaw Challenge we’ve only had two accidents that were the direct result of participants not obeying our rules or the local laws. Always remember that you’re in a foreign country with different rules and ideas about what’s acceptable (don’t interrupt weddings or cows, even if they’re sunning themselves in the middle of the road).